Brimfield Report Antiques Fair Report – Sept, 2012, Days 2, 3, 4. My experiences at Brimfield over the last three days of the September fair were greatly colored by two events. First, on the second day of the show (Wednesday), the remnants Tropical Storm Isaac interfered with the show and dropped torrents of rain and lightning on Brimfield just as the major field opening (Heart of the Mart) was getting ready to open. Three hours earlier, at 6am, New England Motel opened a very wet venue, and my hour of slogging produced just one pitiful Stanley No. 130 double end block plane. With that discouragement, and the downpours later in the morning, I decided I had better things to do at home, and headed for those dry pastures. This alone made the entire Brimfield week a success. The following day, Friday, I again set up in the May’s field, with lesser success than on Thursday, but still profitable. But before starting to sell, I hopped across the street, and shopped for an hour at the opening of J & J’s field. This was worthwhile, as in a short while I scooped up several nice tools from four separate dealers. The first was a decent old Millers Falls No. 1 drill. Then an extended stay with a Vermont dealer produced a Stanley SW No. 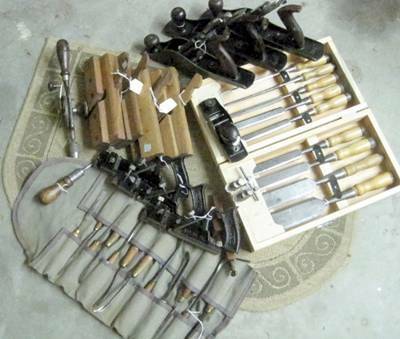 5 plane, a No 10 rabbet plane, a nice pair of chamfer guides, a set of 8 Witherby paring chisels in a homemade box, a set of 10 Buck Bros carving gouges, three Stanley No. 39 dado planes (1/4, 3/8, and 3/4”), a Millers Falls ratchet screw driver, and a GP push drill. After stashing this pile with the dealer, I made a quick loop through the field, buying another Stanley No. 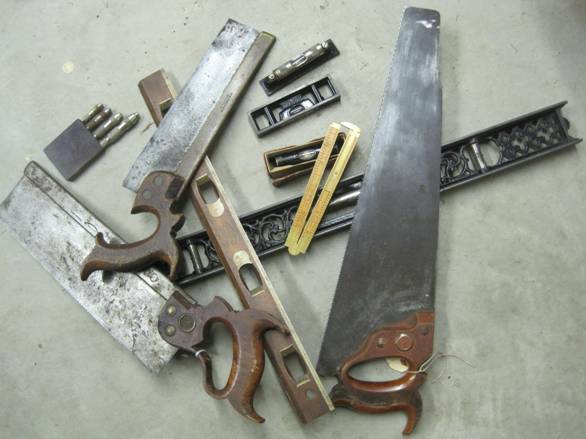 5 jack plane, a decent Disston & Morss No. 10 screw adjust mortise gage, and a Millers Falls No. 97 block plane. This one has the lever blade adjuster that you don’t often see. The final stop was at the booth of a lady who had a few simple molding planes out front. I picked out two P. Chapin (Baltimore) planes, including side bead, and small table joint plane; and a pair of 7/8” match planes by the Sawheag Works in Wallingford, Ct. The nice lady had hefty prices on these, but came way down on her asking price. With these tools in hand, I picked up my stored tools, and went back across the street to do some more selling. It wasn’t a bad day, or a bad week. The fall show at the Brimfield Antiques Fair got underway this morning under gray skies with sprinkles and a dire forecast of showers, sometimes heavy. Fortunately the rain didn’t arrive until I was heading the truck home at about 2:30 pm, and the weather was generally good. It was pretty clear, however, that the forecast inhibited some of the faint hearts—both buyers and sellers—and the crowd seemed pretty sparse. As usual I arrived about 5 AM, and made my way to the traditional first field that I routinely. Also, as usual, my favorite dealer in the field was open for business, and had put aside a few things for me. After some culling of the herd I decided on a new (to me) No. 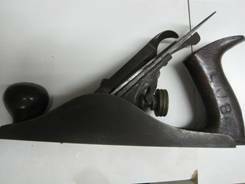 3 size smooth plane with decided Ohio Tool Co affinities, such as a tapered “Thistle” brand iron, and a twisted lateral lever. It has a distinctive blade adjustment knob with three ridges that are very finely knurled, and a low, fairly squat rosewood knob. On the toe is cast the number, “No. 323.” I’ve not seen this before. The other tools in my pile included a sleek, nearly new marlin spike, and sailor’s palm, a great little box of Goodell-Pratt steel number stamps with a fine label, and dandy No. 61 low angle block plane—which is not a common number. When the total was worked out, I must have expressed some displeasure for the dealer dropped the price another increment, and threw in a dandy hand forged iron with a loop handle for free. It was a good start to the morning. After a period of wandering through a couple of fields with no success I finally found a couple of interesting tools. One was a decent example of the Morse drill index with the cylindrical mahogany body, and the “select a bit” mechanism. This one appears to be full of twist drill bits. Next came a small round scorp (needs a replacement handle), and a fine Jennings folding draw knife. More than most trips to Brimfield, I kept running into a legion tool hounds. In addition to Walt Quadrato from Connecticut, these included guys from Worcester, Fall River, Cape Cod, Mystic, Connecticut, and places farther afield. The word was that most of these folks spent Monday at Brimfield, badgering dealers setting up for the opening today, and coming up with some nice tools. My final purchase was a fairly nice rosewood tool handle, packed with original tools. With this I headed back to the truck to unload, drink some water, change shoes, and have a bite to eat. The opening day at Brimfield sees two dedicated “fields” open that were not available first thing in the morning. Dealers buy spaces for the one day in these fields, and set up to sell for a few hours after the opening. The spaces, by the way, usually cost between $300 and $400 for the average size space, plus a town permit that might run about $30. Today, the Tuesday of the show. has the “Dealers Choice” field opening at 11am, and “Brimfield North,” across the street, opening two hours later at 1pm. Both of these fields are at the far western side of the Fair, about a mile from where I park. So today I had to hike down for opening of Dealers Choice, walk back to the truck to stash my new acquisitions, and then hot foot it back for the opening of Brimfield North, returning again to the truck with any new gleanings. Tonight my feet are sore, and the old body aches! “Dealers Choice” in my experience is not usually a good tool field, Pickings are slim, and the competition is stiff. Today, however, the competition seemed to take a pass. Most of the guys that were up and about earlier, seemed to have retreated, and the pickings for me were better than usual. The first of these was an affable young guy who usually comes up with some tools. Today I bought 3 decent spoke shaves (151, 52, and a “No. 1” from him, plus a wooden heel shave with complete paper label. He also sold me a very desirable bench dog that appears to be quite old, a full set of Irwin auger bits IOB, and a shapely mallet that feels nicely balanced I the hand. Not too much later another dealer had a good looking reciprocal drill that is much larger than you usually see them, and a shipwright’s wooden bevel that I found attractive. Most of these have but a single blade, but this one has two mahogany blades. Best of all the hinge pins on this tool are saw screws and nuts scrounged from a 1890 Disston saw, the medallion on one. I spied in his horde spread out on the grass, a wooden dipper, carved from tropical wood, with some fairly crude decoration on it. The price was cheap, and it could be a sleeper. The next purchase was a precision machinist level, complete with original box, cross level, shafting groove, and graduated vial. The kicker here was that this level, in new condition was made in Poland! Now I’ve never had a Polish level before, and now I have one. My final buy was a slide arm, wedge lock plow plane, this one marked from Bristol, England and in top condition. 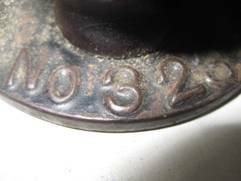 The clincher for me was that an owner had stamped his initials, and the date, and the plane came with a set of 7 blades. Now this new horde had to be carried back to the truck. Returning just 5 minutes before the field opened, I walked down to the back of the field where a fellow sets up who usually has tools (this is field is usually another dry hole for tools). And yes, he was there, and did have some tools. Again, I made a pile quickly, and then sorted through them to make some decisions. 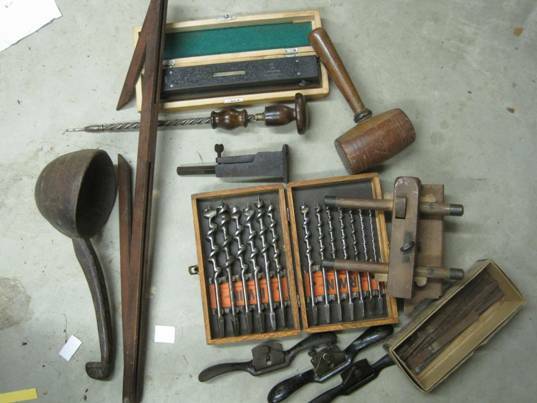 What I ended up with included three saws—an older Disston tenon saw, an English brass backed dove tail saw, and an intriguing panel saw from Brooklyn etched with the name of Cornelius Tenney, and the patent date of Jan. 1, 1884. Erv Schaffer speculated that Tenney might have been an employee of Harvey Peace. The patent is for a small brass reinforcing piece under the handle which this saw has. Aside from the saws, I also bought a 24” ornate iron level by the Williamsburg Mfg. Co of Williamsburg, MA. This is the first level I’ve seen by the maker. Another noteworthy tool is a “paper” rule with Clegg’s patent that was made to rule lines on paper, cut and tear paper, etc. It has several scales, a hollow bottom side, and is generally a wonderful rule. I showed this to Phil Stanley who was on the field, and he thought it to be the most ornate and nicest example of Clegg’s patent (1876) that he had seen. Other purchase here included a 4” Starrett bench rule, a 3 1/2” Starrett No. 130 level in its original box, and a pristine No. 32 ½ Stanley caliper rule. Finally, on the way out of the field a small box of four stepped Starrett pin vises, and a 4” Starrett No. 95 bench level appeared. They went into the bag and I trudged to the truck and then home. Tomorrow sees three new fields (New England Motel, Heart of the Mart, and Jean Hertans) open. But the weather forecast is for heavy rain, and the going will be sloppy. But I expect to be there. After suffering an hiatus from Brimfield reports last September and this past May (many conflicting demands on time), I'm hoping to get back into the swing this summer. Today the July edition of the Brimfield Antiques Fair began, and it was a glorious day. Part of the glory was due to the weather--it was a clear sunny day, but without the oppressive heat and humidity that often plagues the July show. Temps were in the middle 80s F, and it there was no threat of the onerous thunder storms that sometimes beset central Massachusetts at this time of year. The numbers of dealers populating the fields, while below the levels found in May, were certainly higher than I remember at any July show in the past. The buyers were thin at the start, but gradually built over the day to provide a reasonably festive atmosphere. As usual I parked my pickup at about 5am, and immediately moved to my favorite early field, Quaker Acres. There I bought a nice wooden flip-top auger bit box, that was unusual only in that it held a half set of 6 auger bits. This is a scarce box, and I was happy to get it. Next, my most reliable dealer, Gary, had put aside a quite unusual machinist tool. This was a boxed "centering gage" patented by Irving White of Keene, NH in 1902. It is used to center a piston within the cylinder of an internal combustion engine. The nicest thing about it is that it is complete, in very good condition, and has the original instruction sheet with it. It's a nice item, especially since this tool seems to be missing from Kenneth Copes machinist tool book. Gary also had a number of other tools that I gladly scooped up. These included a very nice Stanley No. 84 razor edge spoke shave, an uncommon Stanley No. 62 reversible spoke shave, a nice Yankee No. 50 reciprocating drill, a decent 6" bevel square (unmarked, but obviously a Star Tool Co. patent bevel), and best of all, a brass rolling rule for transferring chart compass bearings to the actual course. What made this so appealing was: a - it was in its original box, b- it has a walnut handle on the top, and c - it was made by an American maker, Theo. Alteneder & Sons of Philadelphia. Alteneder began making scientific instruments in Philadelphia as early as 1850. Rolling rules by American makers are scarce. A quick further scan of Quaker Acres produced only a nice example of a very uncommon No. 20 Goodell-Pratt breast drill. This one has the leather strap across the breast plate, and the "D" side handle. It was heavy enough to force a trip back to the parking lot, to unload the tools. As per usual I then moved to the east end of the Fair, finding just a few things to pick. 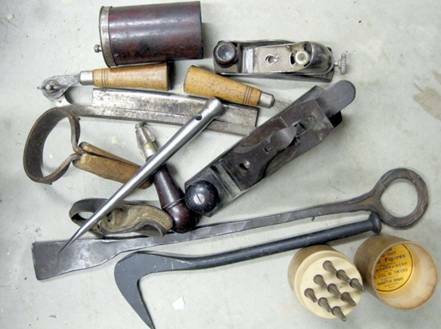 These included a deep bladed Disston D-8 crosscut saw, and a clean Stanley 60 1/2 block plane. After dropping them off at the truck the direction was now to the west. In the Central Park field I made (for me) the most exciting find of the day. This included (from the same dealer) a small, but authentic pie crimper, carved from a Sperm Whale tooth. These are highly collectible, and the price of this one was in the affordable range. The second item was a tool that had an elaborate handle formed by sailor's rope or macrame work that held a chisel-shaped piece of black slate. Almost surely this was a 19th Century sailor's construction of a seam rubber for creasing canvas in the process of hemming an sewing sails. I think it is a spectacular item, unlike anything found in the New Bedford Whaling Museum collection. It made my day! Still moving West, I picked up just a couple of more items (a nice PSW 0102 brace, and a clean Stanley No. 3 plane) In the Meadows field. Not too many tools here, but I did stumble into a tent that had a couple of etchings that caught my eye. These were 1930s sporting etchings by Hans Kleiber. Kleiber came to the US in the early 1900s, settled in Montana, and is relatively famous for his waterfowl and Western landscape scenes. The ones that caught my eye were the larger sized etchings of black birds in a rice field, and a flock of geese landing. They were large, well marked with pencil signatures and dedications, and were in excellent condition. I've had Kleiber etchings before, and judged that these were worth about $500 each. The dealer had no idea of who Hans Kleiber wasand I was able to get them at a very good price. I then mosyed up and down Rte 20 looking in various tents, waiting for the opening of the first restricted fields (Dealer's Choice) at 11am. A decent price was negotiated for a very attractive small bowl adz, but the singular purchase here was a sort of strange ivory rule. This was a square jointed, fully bound (German Silver), 12" four-fold caliper rule by the Standard Rule Co. marked "No. 40 1/2". This was in great shape. The problem is that the catalogue descriptions of both the Stanley and Standard Rule No. 40 1/2 are for 6" two-fold caliper rule, which this one is not. It seems as if the "40 1/2" stamp (on both sides of the rule) is in error. I later showed the rule to the rule guru, Phil Stanley, and he agreed with this assessment. When Dealer's Choice opened, I walked for quite a while finding zilch. But then a few nice tools appeared. These included a mint Millers Falls No. 2A drill (not cheap), a possibly new, but very attractive rosewood caulking mallet head, and another very clean Stanley No. 3 smooth plane. The bag was now so heavy that I had to hoof it back east for a mile to the truck to unload and drink some water, before going back east for the opening at 1 pm of the Brimfield North field (just across the street from Dealer's Choice). That opening produced only a couple of raw whale teeth of decent size (14 oz and 1 lb respectively), and a very nice example of a Stanley No. 10 carpenter's plane. All in all, I thought it was a good day at Brimfield. I especially enjoy finding the odd things, and there were several that came up today. Best of all, when I arrived home at 4 pm, a picker friend of mine was waiting in the driveway with a great 1920s Abercrombie & Fitch cased swordfish harpoon, and a fantastic Victorian sculptural twist drill index, the likes of which I've never seen before. Life was good today--and I get to do it all over again tomorrow!